Each machine project was designed and manufactured using RACER proprietary technology. Our engineering team worked closely and developed a solution to meet the needs of each specific project. Each of these projects range from partially automated to fully automated CNC machines with little or no human operation. With having three different working envelopes along with solutions for 3, 4 & 5 axis machining and HSK 63 and 100 spindle tapers allows for solution to many machining requirements. The overhead tool changers are remote from the work zone and will allow up to 20 HSK 63 tools. 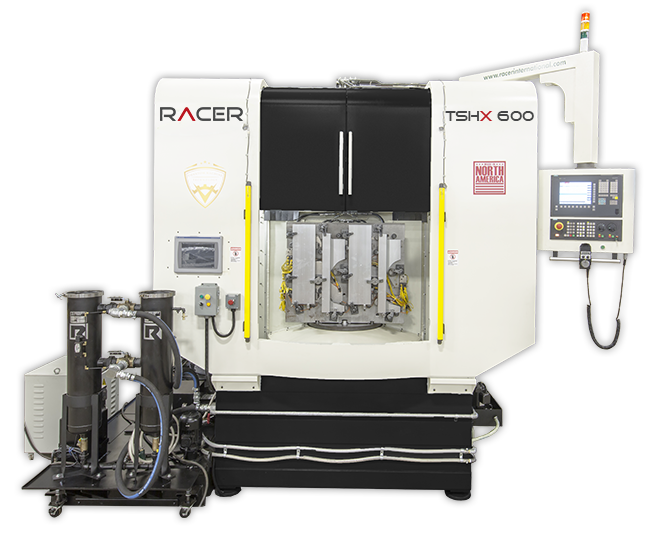 The TSHX 600 was engineered, designed and built for the CNC machining of various aluminum frame components for Tesla models. The FSX 5000 is a 4 axis synchronous motion vertical traveling column CNC machining center with a Fanuc 32i-M CNC Controller and has an X-axis travel of 5.5m. Model shown is equipped with optional RACER specially designed hydraulic vise clamping system. The FSX 5000 was engineered, designed and built for the CNC machining of injection & extrusion screws for the injection plastics mould industry. The DCHX 600 is a dual column - dual spindle CNC machining center equipped with Siemens Dual Channel 840Dsl. The machine is fully automatic operation and requires no operator and includes a RACER turnkey designed part fixture clamping system. The DCHX 600 was engineered, designed and built for the CNC machining of the steel rear axle for the 2015 Chevrolet Cruze models. The DCVHX 1000 is a dual column - vertical and horizontal dual crown turret tool change CNC machining center equipped with Siemens Dual Channel 840Dsl. The machine is fully automatic operation and requires no operator and includes a RACER turnkey designed fixture clamping system. 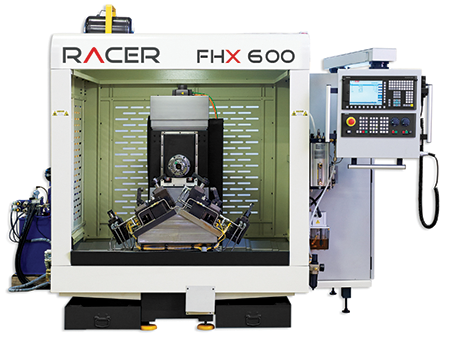 The FHX 600 CNC machining center is a horizontal, fully automatic operation, requires no operator and includes a RACER turnkey designed part fixture clamping system for simultaneous machining of left hand and right hand parts. The DCVHX 1000 & FHX 600 were engineered, designed and built for the CNC machining the 2014 Ford Transit steel front cradle & steel lower control arm. The MCX 2 was engineered, designed and built for the CNC machining of the rear axle for the 2012 & 2013 Fiat 500 models. Need a machine for your next project? Contact us today and see what our engineering team can do for you. The DCVHX 1000 is a dual column - turret spindle tool change CNC machining center equipped with Siemens Dual Channel 840Dsl. The machine is fully automatic operation and requires no operator and includes a RACER turnkey designed part fixture clamping system. The DCVHX 1000 was engineered, designed and built for the CNC machining of the steel front engine cradle for the 2014 Ford CMAX & Lincoln MKC 2015 models. Dual column / vertical spindle with Siemens Dual Channel 840Dsl CNC controller. The machine is fully automatic operation – no operator required, a robot interface and dual tool changers. The DCVX 800 also consists of a RACER turnkey designed part fixture clamping system. The DCVX 800 was engineered, designed and built for the production of the front engine cradle for the 2013 & 2014 Ford Fusion. The FSX 8000 is a 4 axis synchronous motion vertical column travel CNC machining center with a Fanuc 32i-M CNC Controller and has an X-axis travel of 7.7m. Model shown is equipped with optional RACER specially designed hydraulic vise clamping system. The FSX 8000 was engineered, designed and built for the CNC machining of injection & extrusion screws for the injection plastics mould industry. Get in touch with us and we can show you how our technology can benefit your company. 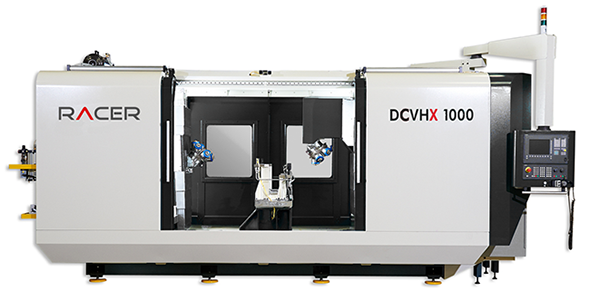 The DVHX 1000 is a dual column - dual spindle CNC machining center with a vertical and horizontal spindles equipped with dual Fanuc Oi-MD controller. The machine is fully automatic operation and requires no operator. Included with the machine is a dual automatic tool changers and a RACER turnkey designed part fixture clamping system. The DVHX 1000 was engineered, designed and built for the CNC machining of the rear axle for the 2012 & 2013 Fiat 500 models. © 2017 Racer Machinery International Inc.